The look of these quick and simple fingerless gloves is inspired in part by Tante Ehm’s wonderful Camp Out Fingerless Mitts, with that wide band of garter stitch around the knuckles. But for this I’ve boiled it down to the essence: a glove you can easily whip out in a bunch of colors or that any beginner can make. If you can cast on, knit, purl, and bind off, you’re golden. There are no increases or decreases; no picking up stitches. And for anyone who’s been wanting to try double-point needles, I think a simple mitt like this is a great place to start. For my fellow beginners out there, I’m spelling it out in full detail below. Continue working back and forth in this fashion, slipping the first stitch on every row, until the opening measures 1.5 inches, ending with a purl row. *If you haven’t done this before, put your yarn and needles down for a minute and form a triangle in front of you with your hands — fingers and thumbs touching. Think of the side of the triangle formed by your two thumbs as needle 2. The fingers of your left hand are needle 1; the fingers of your right hand are needle 3. Now arrange your cast-on stitches into a triangle the same way, a triangle pointing away from you, with all of the stitches running along the inside of the triangle. Your working yarn and tail should be hanging from the tip of needle 3, the top right of the triangle. This entry was posted in Patterns, Projects and tagged free patterns, gloves, knitting. Bookmark the permalink. But don’t you know melted peanut butter is the best! And must have berry jam! In case anyone wonders or is interested, that green Noro version of this that I posted a few days ago did have some increasing going on — I gradually upped it by 6 stitches between the wrist and thumb, then decreased by 2 before starting the knuckle ribbing. That yarn has effectively no give, so the glove had to be shaped to fit. Not necessary with any reasonably springy yarn. Quick question, if you are doing the small size, and using the magic loop method, would 10 stitches, starting a few stitches in from the begininning of the round be a good estimate on the thumb hole? Hi, Natalie. I’m not a magic loop person, but it shouldn’t make any difference here, that I can think of. The thumb section is knitted flat — back and forth from the last to first stitch of the row and back — rather than in the round. Then you rejoin at the top of the thumb slit and resume working in the round. Thanks Karen, I thought that’s what the direction meant but was not sure. I’ve done exactly what the directions say for the thumb. Until the rejoin. Now I’m stuck. Help? Once you’ve done the flat section for the thumb you just go right back to working in the round, like you had been before. 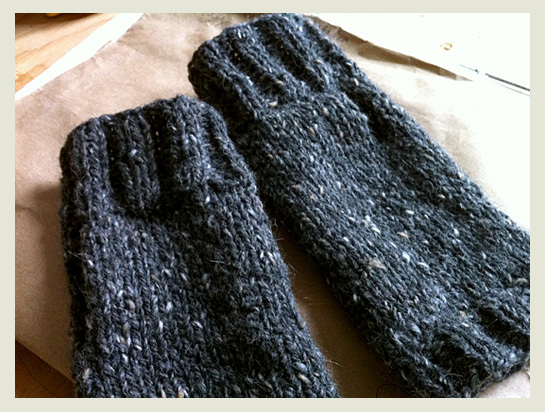 I modified the pattern just a bit to knit these with super-bulky yarn on 10.5 needles. They turned out wonderfully! Thank you for the pattern! ok, so i’m an idiot. I cannot figure out the thumb hole. Do you begin on needle three on the pearl side? Yep, exactly! Work back across the three needles from the “wrong side” (the inside or purl side). Then turn again and work back the other direction from the right side. Back and forth, just like when you knit a flat piece. It’ll seem really awkward for the first couple of rows. Sure! You could definitely knit them flat, then seam up and down the sides, leaving a gap for the thumbhole. I am a complete knitting novice, so if this is a dumb question…sorry. Instead of using multiple DPNs, could this be done using a circular set? hi: I used dpns and got a bit of laddering. I did try and make the first stitch a tight one. Suggestions? I just made these and it was my first project with double pointed needles. Thank you so much for the great instructions! I’m feeling very confident now to try out more patterns with my DPNs!! Thank U for this easy pattern. I have been searching for fingerless gloves and now u answered my wish. As soon as my wireless printer arrives, I can copy the pattern to start and make them for my Grandaughter. Would I do size 6 needles in the 2 needle pattern?? Hello Karen, I have been trying to print the pattern for Super Simple Mitts and have had no luck in doing so. Do you know why I cannot print it. I have never tried DPN’s and noticed that you said it would be a great project to try them on so I would like to do this also. Really like this pattern for Super Simple Mitts. Thank you. Will be anxiously waiting for your reply. Hi, Ruth. I’m sorry — I’m not sure what you mean exactly. It’s just a web page, so the only thing to do is hit print in your browser’s menu and that should do it! So for the thumb section do you bind off the stitches for needle 3 and then co again when you finish the thumb hole??? No, there’s no need to bind off or CO anything. You simply work that section back and forth as if flat, then rejoin in the round to complete the mitt. Is needle 3 the one with 8 stitches on it? You can really divide them up however you like, as long as they’re fairly even. If you do as I’ve described above, you’ll have 12, 8 and 12. Hopefully this isn’t a dumb question – but if you’re just slipping the first stitch from one needle to the other when working on the thumb section, how dow that first (and last stitch) not become one very long thread at each side of the thumb hole? To me it would make more sense if you just went ahead and purled (or knit) that stitch as you would the others. You get a little bit nicer looking edge if you slip the first stitch of each row (which then gets worked at the end of the following row), but you can certainly knit/purl it if you prefer! I am looking for a fingerless glove pattern knitted on a circle needle .Any ones you know of?I also want to knit with a worsted weight. I’m a newer knitter to mitts so I’m having trouble with thumb hole section. Where the pattern says ‘next row: hold needle 3 in your hand….to begin knitting back and forth….’ I’m completely lost as to what i’m supposed to do here! Is there any chance of a video for this section of the pattern as I’m more of a visual learner rather trying to figure out written patterns. I’ve purled from needle three to needle one but I don’t think I was supposed to do a ‘round’ of knitting? Help!! Thank you for any help in this matter! Hi, Stephanie — not sure how this got missed before. It sounds like you’re doing it right. If you’ve purled back across the WS, that’s the first row of the flat section. Just turn the work and knit back across the RS, then repeat! 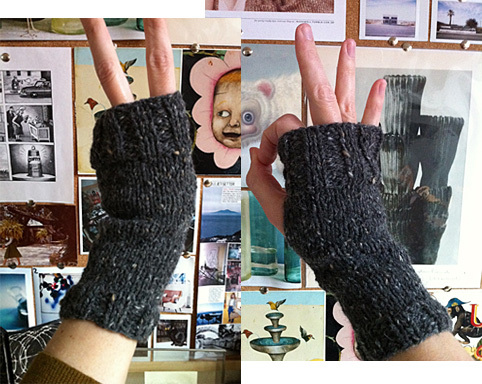 When I made these I ended up with two thumb holes. Any idea why? Is it because I made them on normal circular needles instead of DPNs? I honestly can’t even imagine how that would happen! If you want to send me a photo at karen@fringeassociation.com that might help me understand and advise. How do you make a thumb hole if you are just knitting this pattern using circular needles? Hi, the process is the same regardless of what type of needles you’re using — you’ll work that stretch back and forth as if knitting flat, then rejoin in the round as described.